When you travel abroad, especially far away from home, you want to have peace of mind. In Zambia you’ll achieve that. If your desire is to meet warm friendly people then travel to Africa's peace haven, Zambia. You'll find that which you desire most, the warm African welcome!. The Victoria Falls one of the most spectacular waterfalls in the world, formed as the wide and entire flow of the Zambezi River dropped from a relatively flat plain into a narrow cataract deepened to 122 metres and zigzagging for 72 kilometres. The Victoria Falls is considered the world's largest curtain of falling water measuring 1,701 metres wide and 111 metres deep. The mist and noise produced by the drop inspired the Kololo people living in the area to name the waterfall Mosi-oa-Tunya (“smoke that thunders”). The waterfall, with it’s nearby game park is a major attraction for visitors to Zambia. The wild Zambezi River . From its source in Kareni Hills to its mouth at the Indian Ocean the Zambezi measures a whopping 3,540 kilometres of which about 2,272 kilometres is in Zambia. The river passes through changing sceneries. The first major scenery is the Barotse Flood Plain, site of the colourful Kuomboka Ceremony of the Lozi people, one of Zambia’s most popular traditional ceremonies , the second being the violent torrent at the Victoria Falls that cut a deep Batoka Gorge, the third is the serene Lake Kariba that has collected behind the hydroelectric dam in the Zambezi rift valley. Kariba is a lake with a great history such Operation Noah . Finally the wide Lower Zambezi River surrounded by numerous game. Lower Zambezi National Park is Zambia's newest park. Add to your travel itinerary the Nchanga Open Pit the second largest open cast copper mine in the world and the largest in Africa. Operations started in 1955 and today it measures seven kilometres long, three kilometres wide and bottoms up at 300m. Zambia's major economic activity still remains copper mining. The well endowed national parks and 34 game management areas. All this constitutes 30 percent of the 752,614 square kilometres of Zambia. The game management areas buffer most game parks. The parks are strategically located throughout the country. The unbelievable yet fascinating wildlife in pristine wilderness. The parks in Zambia are considered to have one of Africa's largest concentrations of game and among the top in the world. The diversity of animal species is wide with over 200 mammals that include the Big Five: lion, giraffe, leopard, rhino and elephant. Annually there is a wildebeest migration in the Liuwa National Park where tens of hundreds animals are involved about October / November each year. Then there is the endemic and graceful black and red lechwe antelope filling the Busanga and Bangweulu Plains. Lochinvar National Park in the Kafue Fats is Zambia's prime bird's sanctuary with over 429 bird species. river-rafting, bungi jumping, river boarding, skiing and fishing, Abseiling, off highway 4x4 driving, elephant back safari, river safari, micro-light and helicopter flights over the Victoria Falls, a visit to any of the three museums, a visit to Mukuni Village set in tribal tradition, etc. The Zambian weather is mild and pleasant despite the country being in the tropics. The high altitude between 1,300 and 1,500m above sea level ensures that. There are three distinct seasons; the winter, cool and dry between April and August, spring dry and warm between September and November and the warmer and wet season between December and March. However, the most popular time to visit is during the cool and dry winter season when days are warm and sunny and the nights clear and cool. Zambia is now the awakening safari country! All because of the pristine wilderness, the profusion of wildlife including birds and insects, the exquisite sunsets, the changing beautiful landscapes and the warm Zambian welcome of its friendly people. 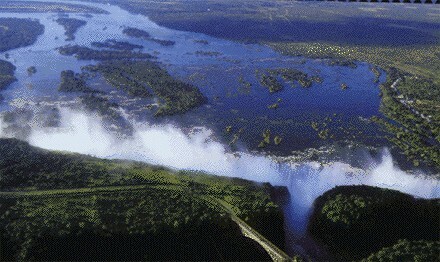 All these make Zambia a pleasant destination in Zambian tourism . It's a safari visit you'll treasure forever.